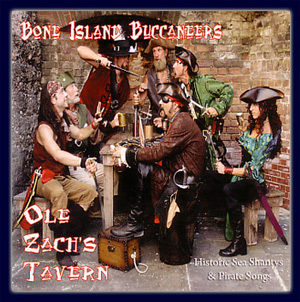 With their album, Ole Zach’s Tavern, the Bone Island Buccaneers strike a delicate balance – they sound polished enough to be musical, but rough enough to still be pirates. All too often a pirate song is sung by a voice that’s clearly never tasted a lick of rum, but I’ve an inkling that the entire crew of Bone Island has indulged in at least a dram or two on occasion. Ole Zach’s Tavern features 11 traditional tracks that have already seen a fair share of play on pirate and shanty albums nationwide. The remaining tracks include Billy Bones (a cover of Skip Henderson’s own marvelous creation) and one original song, Sword and Iron Thunder. Traditional pirate songs are becoming a sticking point with me, being as pirate shanty groups seem to be on the rise – as do their CDs. While a dozen essentially similar groups spread across the nation can serve a purpose, having a dozen similar CDs does not. Considering the familiar names in the track list of Ole Zach’s Tavern, this concern was at the forefront of my mind as I gave my first listen. Fortunately, Bone Island Buccaneers inject enough peronality into their music to land the CD just this side of unique. Occasionally this injection of pesonality takes the form of laughs between verses, exclamations of “yo ho” or “drink up me hearties” – but only enough to add flavor, and not so much as to distract. But it’s the music and singing themselves that define this album. The male vocals sound good natured, but hardly angelic – pleasantly roguish. The female vocals have a taste of the vixen about them, but a well-armed vixen with a history of stabbing. As to the instruments, they’re pretty basic – simple guitar strums keeping pace with the singing. But it makes for a fine compliment to the vocals, and the finished package is quite believably piratey. This entry was posted in Music and tagged bone island buccaneers, pirate shanties, pirate-folk by Bilgemunky. Bookmark the permalink.